Steven (Chicagoland, United States) on 13 July 2010 in Cityscape & Urban and Portfolio. 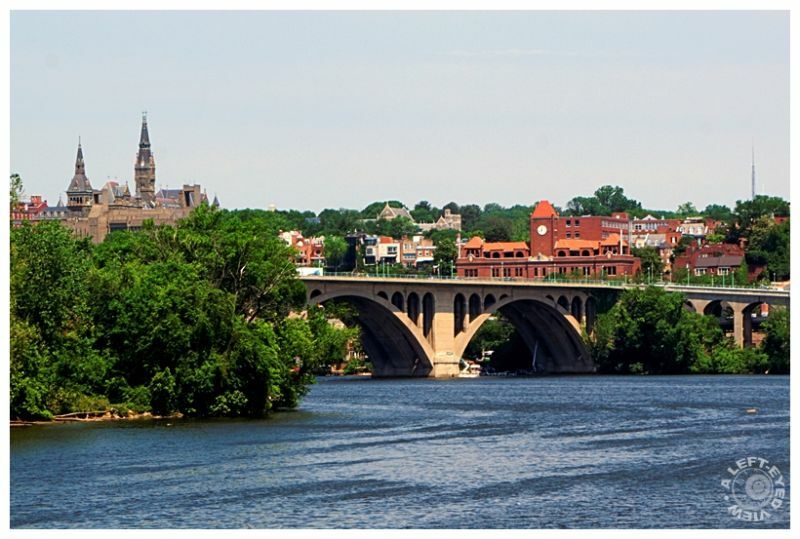 Shortly before noon we were heading across the Potomac River on a footbridge to Theodore Roosevelt Island when I turned back and noticed the Francis Scott Key Bridge, which connects Virginia with Washington, DC. The Classical Revival bridge was designed by architect Nathan C. Wyeth and engineer Max C. Tyler. It was built by the United States Army Corps of Engineers between 1917 and 1923, and was named after Francis Scott Key, author of The Star Spangled Banner. The northern terminus of the bridge is just east of the site of Key's Georgetown home, which was dismantled in the late 1940s; near that site, there is now a community park honoring Key. The exposure of this photo, as seen on a different computer, disappoints me. I hope you don't see this as dark as I do. It's hard to gauge how bright (or dark) a laptop monitor's exposure level can be when the angle of the laptop's monitor can make all the difference. I try to keep my laptop monitor at about a 90 to 95-degree angle. Superb capture and your landscape is very beautiful. I like it. Have a nice days Steven. Nice composition, a very beautiful bridge too ! Superb capture very good color's, bravo! Looks fine to me, too . . the scourge of angle-of-incidence haunts us still despite all the techy advances and calibrations ! Beautiful architectural design that these old bridges have. Looks like the water is up. You've chosen a wonderful vantage point. Great image looking back and I like the water in the foreground! Looks great to me! The bridge and river are beautiful and I like that red brick building with the clock tower. Lots of neat old buildings in this scene. No worries Steven, the daytime shots ae tough but this looks great to me- the setting almost reminds me of a Prague-like or Budapest-like scene....I was never aware of this bridge. Great work with the brightness and color of the day...I like this alot!! Cheers! beautiful shot! love the POV! Very nice composition!!! !